For this month's "Maps Of The Month" featurette, I wish to draw your attention to Will Mallia's Vice: Project Doom (NES) maps. Detective Hart of the Vice unit investigates the mysterious BEDA Corporation, which is involved in military technology, but also turns out to be a front operated by aliens. The aliens' "Gel" is a substance used as a drug which has serious effects on humans. Hart will have to drive, jump and shoot to get to the bottom of this convoluted story and save the world. Vice: Project Doom is often compared to the Ninja Gaiden series because of its partly animated cutscenes telling a slightly more mature story (by NES standards) and the highly detailed graphics that make up the dark locales that our hero must traverse. But in addition to the side-scrolling action, the game also features a couple "Spy Hunter"-style driving sections as well as two arcade-style first-person shooting segments. It really is a underrated game that never came close to being as popular as its ninja-themed cousins on the NES, but is still a comparably good time. 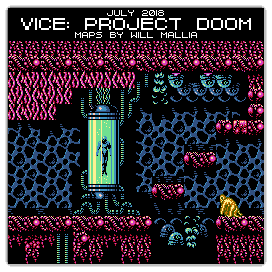 So the recognize the effort put into mapping this "dystopian future Ninja Gaiden with aliens" that deserves to be better known, Will Mallia's Vice: Project Doom (NES) maps will be known as VGMaps.com's Maps Of The Month for July 2018. Nice Game, got it by coincidence at a Fleahmarket in 2002, with other games for cheap. I like the Background effects in Stage 2 (zig-zag moving of the Night City Skyline mirrowing in the Water). Also nice music and graphics Detail. There are local differences in the Japo an Western Versions. Never heard or read of it bevore then.